UQ researchers discover the Australian and Asian beaked sea snakes are two unrelated species despite the snakes identical appearances. (Phys.org)—Scientists have discovered that the lethal beaked sea snake is actually two species with separate evolutions, which resulted in identical snakes. The University of Queensland's Associate Professor Bryan Fry said the Australian and Asian beaked sea snakes were originally thought to be from the same species, however, in comparing their DNA, the research team had found these two snakes were unrelated. "This mixup could have been medically catastrophic, since the CSL sea snake antivenom is made using the venom from the Asian snake based on the assumption that it was the same species," Associate Professor Fry said. "Luckily, the antivenom is not only very effective against the Australian new species but actually against all sea snakes since they all share a very stream-lined fish-specific venom." Associate Professor Fry said the finding was an example of a situation where two species evolved separately but ended up looking similar, known as the convergent phenotypic evolution phenomenon. Associate Professor Fry said that the 'beaked' morphology of the species could be associated with the extremely specialised niche the snakes occupy, even though both species evolved from different ancestors and were not even close relatives. He said the two species occupy the same specialised habitat of silt-filled shallows of tropical estuaries throughout the Asian and Australian regions. These snakes are responsible for the majority of deaths and injuries to fishermen handling nets in these habitats. The Asian snake will retain the original name Enhydrina shistosa. 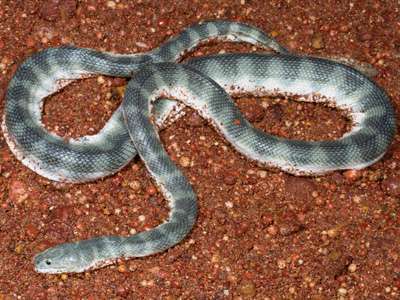 Australian beaked sea snake has been given the scientific name [Enhydrina] zweifeli, which identifies the region in New Guinea where it is found. The new snake will be placed in a separate genus to the true Enhydrina genus in a followup publication that will resolve the complex higher order relationships of sea snakes. This finding was published in Molecular Phylogenetics & Evolution by Associate Professor Fry from UQ's School of Biological Sciences and colleagues from the University of Adelaide.